Taxpayers may blush when they learn that their $8 billion-per-year Transportation Security Administration (TSA) is hardly satisfying its purported mission of protecting the nation's transportation systems to ensure freedom of movement for people and commerce. According to a June 2015 report by the Huffington Post, the TSA has failed 95 percent of airport security tests conducted by Homeland Security. Corroborating this story, ABC News reported that undercover investigators revealed security failures at dozens of the nation's busiest airports, successfully smuggling mock explosives or banned weapons through checkpoints in 95 percent of trials. Oddly yet unsurprisingly, the Transportation Security Administration conveniently dismisses rules — such as the removal of shoes, belts, and jackets, the separation of laptops from luggage, and the use of bins — when these shortcuts suit their whims. One may then wonder how many of these perceived rules have spawned from the traditions of TSA workers who were, in the strictest sense, operating merely from their own discretion, suspicions, and loose interpretations of their respective positions. The make-work only seems to fester within these busy-bodied organizations of ambiguous ends. Even the queue now falls under the systemic scrutiny of TSA agents full of Walmart-style greetings, multi-billion-dollar smiles, and the childish curiosity of unskilled adults trained to swipe hands to determine whether travelers are fit to roam the airport and board an airplane, all with only a perfunctory understanding of technical indicators supposedly capable of achieving these ends. While swiping my hands today, the TSA agent wished to engage me in conversation. When did this become compulsory? He was conspicuously confused and displeased with my silence, resorting to harsher, more demanding tones upon my continued silence despite his repeated attempts to buy my efforts, my words, and something more than my obedience, probably to reconcile the discomfort of unfounded authority into which his employment has placed him. Complementing the scene of organized incompetence is a K9 unit which strolls about the aisles, seemingly successful only in disrupting the gaits of eager travelers who, despite understanding the futility of the TSA, tolerate the inconvenience because their fellow travelers are willing or because the marginal costs of resisting outweigh any probability of benefit, or to serve the long-shot chance that their minor inconvenience will enable the TSA to thwart that next terror threat, despite a tested record showing otherwise. Part of the reason why so many people are willing to work for or endure the processes of the TSA is related to the continued deference and social payment of smiles and gratitude issued to those who work for this fruitless agency. They earn far more in the social graces shared with them than they earn on their paychecks, but the combination comfortably warrants the per-capita ease of the sufferable masquerade. In due time, however, the theater will become more tangible and more vast, eventually reaching you before you even arrive at the airport — some of this is already happening. With each forced smile, uncomfortable discussion, swiped hand, and groping agent, we surrender our personal dignity and our liberty to favor a notion which presupposes that each individual is a criminal until cleared by a higher authority. 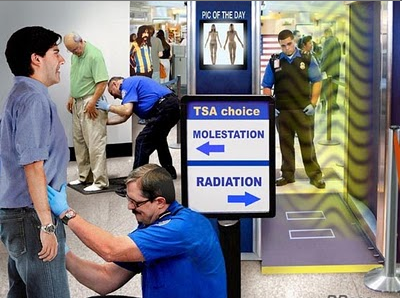 The TSA has proven to be nothing more than a modern boondoggle. Let’s free its workers to contribute to the lives of its donors instead of forcing Americans to pay for a service to which they never consented. The TSA is yet another example of the progression from physical, apparent slavery to its psychological, more palatable counterpart of assumed responsibility and taxation. This isn’t progress at all. What's more, it's unconstitutional.